Over the past five months, I have had great success betting on ITF tennis. For those that do not know, the ITF Tour lies below the ATP/WTA Tours and the Challenger Tour and generally represents the lowest level of professional tennis. It generally consists of career journeymen, a few former top 100 players in the last moments of their careers, players coming back from injury and young hopefuls, who are just starting out on their tennis careers. These are players known by few tennis journalists or punters. However, every player starts out here at some stage in their career. Virtually every player in the top 20 in both the ATP and WTA have played and won ITF events early in their careers. The relative obscurity of the vast majority of players means that there are often profitable opportunities for the smart punter, who is willing to put in the research. Personally, I have a database of over 25,000 matches, consisting of matches from the leading global junior tournaments, American junior tournaments in a range of age-groups down to U14s, Australian money tournaments and European junior tour events. At the moment of writing, I have logged 141 ITF bets on this website, showing a profit of 81.53 units on 352 units staked, giving an impressive ROI of 23.2% (see the breakdown here). Over the past few weeks, a number of people have asked about what it is that I look for in selecting bets and what information I consider when making the decisions. Thus, I have decided to put an example together based on my latest recommended bet to show the decision-making process and what resources I use. Rather than using my database, I will demonstrate it using resources available on the internet. 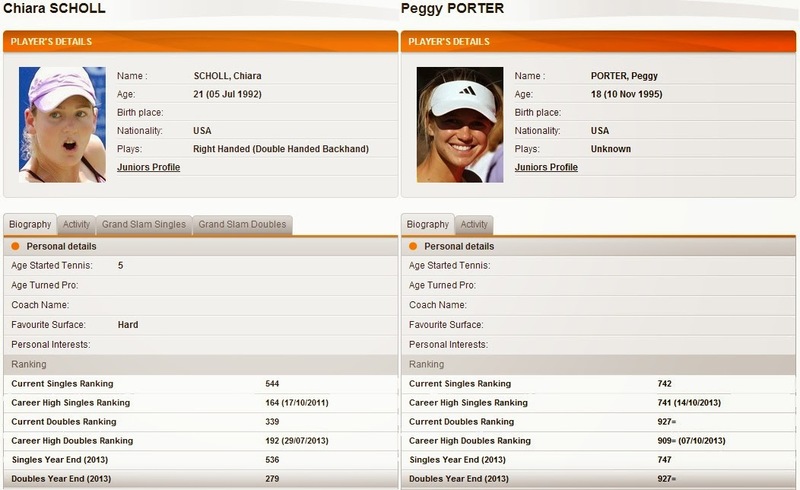 The match that I will use as the case study is Chiara Scholl against Peggy Porter. This is a first round match from the Gainesville ITF event in Florida, taking place on outdoor clay. Chiara Scholl is the seventh seed and Peggy Porter is unseeded, and both players had an automatic place in the main draw. As the image above shows, the starting odds from Bet365 are 4/6 on Chiara Scholl and 11/10 on Peggy Porter. The first thing to look at is the ITF website. We can see some basic facts about the two players. On the left, 21-year old Chiara Scholl is currently ranked at #544 in the world, significantly below her career high ranking of #164 that she achieved back in late 2011. On the right, 18-year old Peggy Porter is ranked at #742, which is virtually a career high ranking, just one place behind the #741 that she achieved in October last year. In terms of other information that we can glean from this page, we can see that Scholl lists hard courts as her favoured surface. One thing to bear in mind is that young players are limited in the number of tournaments that they are allowed to play. As a result, their rankings can often be lower than they should be. The activity tab shows us every match that each player has competed in on the ITF or WTA tours over either the last 12 months or their entire career. For Scholl, we see that she has played 36 matches in the last 12 months compiling a 10-26 record – far from impressive. Indeed, she has won just 4 matches from 20 matches on clay, although several of them were against significantly higher ranked opponents. Only one of those clay court wins was against a player inside the top 600 in the world, while several of the defeats were against players either outside the top 1000 or unranked. Going further back, she does have a handful of quarter-finals in ITF $10k and $25k events, but the most recent was back in mid-2012 with the majority being during 2011 when she had her run to her career highest ranking. Peggy Porter has compiled a 7-6 record on clay in the last 12 months, including a run to the semi-final of a $10k event in Bethany Beach in June last year. Furthermore, only one of those defeats was against a player outside the top 600 in the world. To get a further idea about the players, particularly Porter, we can look at their junior records. For this particular matches, there is little information of use. Scholl never played a junior match on clay, suggesting that she does not like the surface, while Porter played a handful with little real success. Our next stop is the American college scene. A large number of the younger American players come through the college system, where we can often find a number of matches that are not detailed on the ITF website. As it happens, Chiara Scholl is one of the rarer American players that has not been involved in the college system. At 18-years old, Peggy Porter has not started college yet, so does not show up on the system either. We can see some more information here. She is from Dallas, but she has committed to go to college in Florida, which we can presume is likely to be one of the reasons for her playing these ITF tournaments in Florida. The University of Florida is located in Gainesville, which is where this tournament is being played. Whether there is any home advantage is unknown, but it could be something to bear in mind. 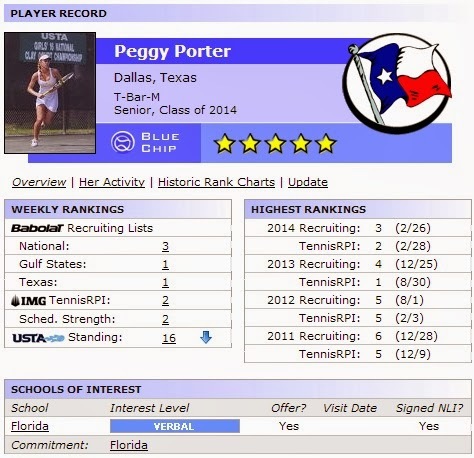 She is rated as a blue chip recruit, which is the highest rating for high-school players. Furthermore, we can see that she is rated as the #3 ranked player nationally for the ‘Class of 2014’ and rated one place higher at #2 in the IMG TennisRPI list. The TennisRPI rankings are updated weekly and are used to determine the top junior players across the USA. It takes into account a player’s winning percentage, a player’s strength of schedule and the strength of schedule of a player’s opponents. We can see that she has compiled a record of 26-9, giving a winning percentage of 74.3%. While this is below several of the players below her in the rankings, it is balanced out by the fact that she has played the second-toughest schedule of the players in this class. We can compare her ITF ranking against those players around her to get an idea of how representative it is. 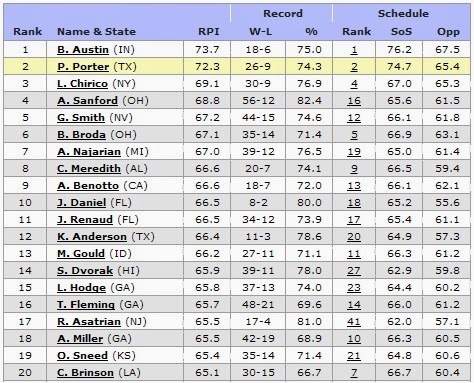 As a comparison, Brooke Austin is ranked at #586 and Louisa Chirico is ranked at #349. Possibly we can conclude that her ranking might be slightly below its true position due to having played fewer tournaments. Looking at her activity, there is one tournament that stands out as containing potentially useful information. 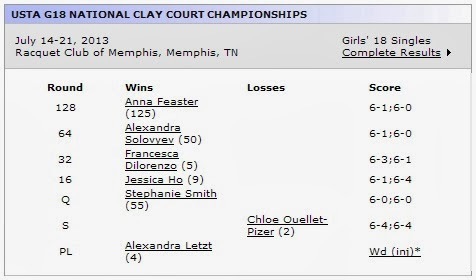 We can see that she played in the U18 National Clay Court Championships last year with some success. She reached the semi-final of the tournament, where she lost to Chloe Ouellet-Pizer, who is a decent clay court player that reached the third round of the prestigious Eddie Herr tournament in December. In other words, while clay may not be Porter’s favoured surface, she is not completely out of water playing on it. The final check often will not turn anything up, but is worth doing. By searching the player’s name on Google, we can occasionally find news articles or pages that may provide the odd snippet of information. By searching for Peggy Porter, we find a press release from the University of Florida with one useful piece of information. It mentions that she won the 2013 Collegiate Clay Court Invitational, again suggesting that she may be a decent player on the clay courts. For Chiara Scholl, there is no particularly useful information. With all this information, we can now return to the prices. We have Chiara Scholl, who enjoyed a few good runs on clay back in 2011 when she was playing much better tennis than she is currently playing. She does not play much on clay and has struggled on the surface in recent times, while she is also horribly out of form. Her previous high ranking does suggest that she does have talent, but there is little in the past year to suggest that she is anywhere close to that right now. On the opposite side, we have Peggy Porter, who is playing in a location that she is set to call home for the next few years. She has enjoyed some good clay court results at the junior levels, while she has also reached a $10k semi-final on clay last summer. She is one of the top ranked players in her class and similar rated players have enjoyed reasonable success recently – Chirico reached a $25k quarter-final on clay and reached the semi-finals of the Junior French Open, while Austin has reached a $10k semi-final and taken a set off the talented Kleybanova. Obviously, we have to weigh up all of these factors to decide whether either of the prices is value. In this situation, I am happy to back Peggy Porter at odds of 11/10. However, this is the decision that is up to you. Some people will put different ratings on the various aspects and may come up with a different conclusion. Maybe some people will think that Scholl is the value. Others may feel that the prices are right and that there is no bet in this match. That is the joy of betting – no two people will have exactly the same view on a match. Regardless, I hope that this article has given people an idea of some of the resources and statistics out there and how they can be used to weigh up and analyse a tennis matches. If anyone has any further ideas as to what could be added to this analysis or different ways of approaching it, feel free to mention them in the comments below. I would like to try your advice. But i have a few questions and i don't know if you still out therehow doyou you choose your ift tournament and the players?